Today we are sharing Data Interpretation Practice Set. Try to solve the following Questions based on data given in Pie Chart and Table and Share your marks in comment box. followed by a table which shows the ratio in which each company produces the two medicines and also the percent profit that each company earns in selling medicines A and B. Study the given information and answer the questions that follow. 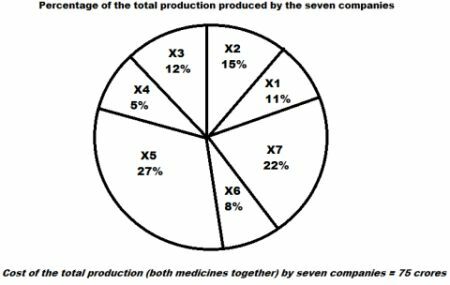 Ratio of production between medicines A and B and the percent profit earned for the two medicines. 1) Find the ratio of cost of production of medicine A by Company X2 to that by Company X6? 2) The total cost of production of medicine A by company X2 and medicine B by X1? 3) What is the total cost of production of medicine B by Companies X3 and X4 together? 4) The cost of production of both medicines together by Company X5 is equal to the total cost of production of both medicines together by which of the two companies? 5) Find the amount of profit earned by Company X6 on medicine B. 6) What is the total profit earned by Company X3 for medicines A and B together? which is same as that for company X5.